Romanians across the country took to the streets in protest Saturday, accusing the government of limiting voting from citizens living abroad in the recent presidential poll. Thousands of Romanians living abroad have complained they were not able to vote in the November 2 first-round presidential election due to an insufficient number of polling stations at Romanian Embassies. Prime Minister Victor Ponta won 40 percent of the first-round vote, 10 points ahead of rival Sibiu Mayor Klaus Iohannis. 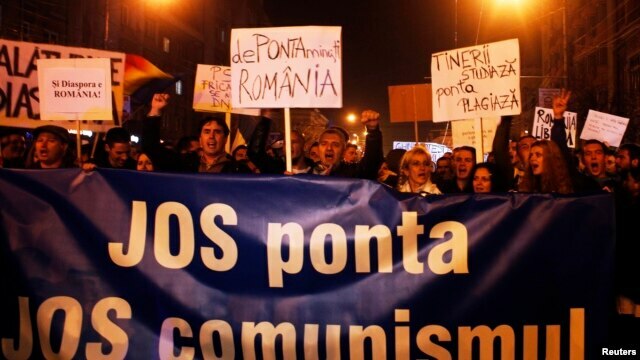 However, Iohannis won 46 percent of the vote among Romanians living abroad while they gave Ponta 17 percent. Romanian officials said Saturday more polling booths would be open for the second round of voting on November 16. Ponta, a former prosecutor, has pledged, if he is elected, to lower taxes, raise pensions and to uphold good relations with the European Union. Incumbent President Traian Basescu is stepping down after 10 years in office. Material for this report came from AP, AFP, and Reuters.